And GAZEDESK will be there with Our new friends, Giiro. New ergonomic workspace, Giiro, See you CES 2018. 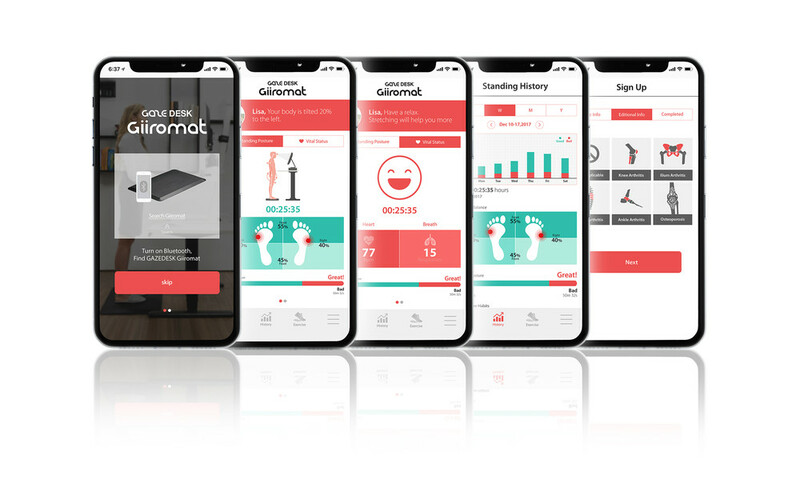 The GiiroMat, automatically measure your posture with embedded sensors that can detect 256 (two hundred fifty six) levels of pressure on any part of your feet. We analyze your standing posture and gently nudge you to help you correct bad posture and improve your health through APPs and robots. You can check the change of your posture on the history screen. The Giiromat encourages movement and stretching while standing if there is no change of posture for a long time. The Brand new Posture Mimic bot, Giiro. He only has a one eyed. But his wide eye keep looking on you. Sit – stand desk or ergonomics products are not only answer for correct posture. Our essential ergonomic anti-fatigue feet mat so we named Giiro and the posture mimic bot is help your correct posture. Giiro always keep an eye on you. Collect your data ; processing collect data to increase correct body posture. He is the ultimate human factor behind children’s cute smile. Giiromat is the anti-fatigue feet mat for comfort floor mat. This product is not only for anti-fatigue mat, but also collects your data, analyzes, and sends it to Giiro and Giiro app. More than 600 real times built in sensor measured in precisely display 1024 levels Intuitive graphics result. And collected data analyze for your body. All those data display your body changing. Giiromat is ergonomics anti-fatigue feet mat This product has programmable time reminder and integrated works Giiro bot. This Jan, Giiromat will be released first, CES 2018.